Torsion bar suspensions system use a steel bar (wrapped in a sleeve and encased in hard rubber to minimize road noise) connected to a lever arm to control up and down motion. Air bag suspension systems use automatic pressure regulators that adjust the air pressure in each air bag to compensate for various tipping forces experienced during travel. Therefore, when you’re going around a tight corner or experiencing heavy cross winds the air bag system will automatically compensate for the lean of your RV. *Always make sure your air system is at operating PSI before traveling. 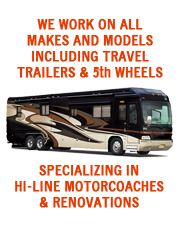 If you are experiencing any of the potential problems listed above have your RV repaired by an RVIA certified RV service technician at an authorized RV repair center.